(Phys.org)—One of the greatest challenges in generating energy from renewable sources is finding a way to store the continuously fluctuating energy being produced. Batteries, supercapacitors, and most other energy-storage technologies typically can't respond quickly enough to the second-by-second fluctuations inherent in wind and solar energy sources. One device that does have a sufficiently fast response is electrostatic capacitors, but their drawback is their low energy density—they simply cannot store very much energy in a given volume. Addressing this problem, researchers in a new study have shown in simulations that antiferroelectric materials based on bismuth can potentially exhibit very high energy densities (150 J/cm3), making them a promising candidate material for electrostatic capacitors. The results point to the possibility of a high-performance, environmentally friendly energy-storage device for renewable energy sources. The researchers, Bin Xu and Laurent Bellaiche at the University of Arkansas, and Jorge Íñiguez at the Luxembourg Institute of Science and Technology, have published a paper on their investigation of antiferroelectrics for energy storage in a recent issue of Nature Communications. "We predict that rare-earth-substituted bismuth ferrite is a very promising system for high-power energy storage due to its high energy densities and good efficiencies, as well as its tuning flexibilities," Xu told Phys.org. "The model we developed connects the storage properties with fundamental energetic properties, which may lead to the discovery of new storage materials based on antiferroelectrics." The key characteristic of antiferroelectric materials is that their adjacent electric dipoles point in opposite directions, which cancel out and result in a net zero polarization. As a result, the materials become ferroelectric under the application of a sufficiently large electric field. These electric properties can be easily tuned by controlling a variety of parameters. In the new study, the scientists took advantage of this tunability to increase the energy density and efficiency of a particular lead-free antiferroelectric compound (rare-earth-substituted BiFeO3). By changing the orientation of the electric field and the rare earth composition, the researchers predicted the potential for a very high energy density and high efficiency. They expect that tuning other parameters, such as strain or the addition of other rare-earth dopants, may improve these properties even further. The simulations also enabled the researchers to develop a model to explain the connection between the energy density and the tunable parameters investigated here. This model should also provide guidance for the development of antiferroelectric-based capacitors in the future. The researchers hope that these theoretical results will motivate efforts to experimentally demonstrate antiferroelectric materials with high energy densities. 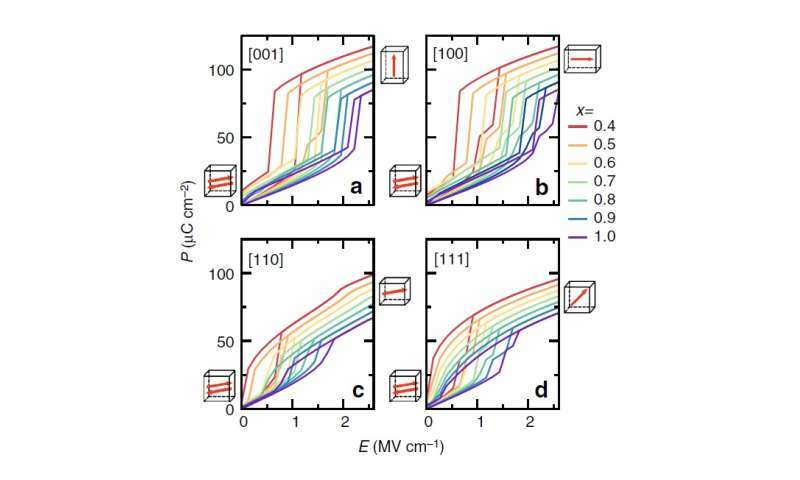 "With the model, we are interested in assessing the storage properties of known and hypothetical antiferroelectrics via high-throughput first-principles calculations," Bellaiche said. "The promising candidates will be further examined, in collaboration with experimentalists and other theorists." Dielectric capacitors, although presenting faster charging/discharging rates and better stability compared with supercapacitors or batteries, are limited in applications due to their low energy density. Antiferroelectric (AFE) compounds, however, show great promise due to their atypical polarization-versus-electric field curves. Here we report our first-principles-based theoretical predictions that Bi1−xRxFeO3 systems (R being a lanthanide, Nd in this work) can potentially allow high energy densities (100–150 J cm−3) and efficiencies (80–88%) for electric fields that may be within the range of feasibility upon experimental advances (2–3 MV cm−1). In addition, a simple model is derived to describe the energy density and efficiency of a general AFE material, providing a framework to assess the effect on the storage properties of variations in doping, electric field magnitude and direction, epitaxial strain, temperature and so on, which can facilitate future search of AFE materials for energy storage. "[...] supercapacitors [...] typically can't respond quickly enough to the second-by-second fluctuations inherent in wind and solar energy sources." I have seen no evidence supercaps charge/discharge too slowly for solar and wind energy storage. In fact the opposite is true, especially on a 1 second scale. "Dielectric capacitors, although presenting faster dis/charging rates and better stability compared with supercapacitors or batteries, are limited in applications due to their low energy density." That statement from the researchers conflates caps and batteries in dis/charging and stability quality, so it's unclear that they're saying dielectrics are faster dis/charging than supercaps - which they aren't. Meanwhile supercaps are "super" because of their high energy density, >= electrolytics. Antiferroelectrics might be the best, but those characterizations of supercaps baselines are wrong. Mr Heinlein thought up Shipstones. The best energy storage we have, aside from the energy stored in the nucleus of the atom, is the solar energy stored in petroleum and coal. Cheaper too. are you really that f*cking stupid? so lets look at your brand of logic and apply it to everything else! and deniers wonder why we think they're so stupid? Why not just pump water up hill. There aren't hills (and big reservoirs at high elevations, and sources of water) everywhere. Duh. And you will find that where these conditions are met such systems already exist. The amount of extra hydrostorage that can be built is fairly limited. One big opportunity with renewable generation like wind and solar is that it can be distributed rather than centralized. This has reliability advantages as well as the possibility of avoiding transmission losses when located closer to consumption. Pumped storage is much more centralized. Batteries are much more distributed. They can be integrated with the generator or just distributed in better locations on the network. "are you really that f*cking stupid?" Sorry Capt but Shootist is 100% correct. You might not particularly like fossil energy but but it is the best we have at this point in time. Ad hominems do not make your case any stronger. and surely you can remember when this was also said about leaded fuel?